When Frank Yturria was a young boy in the Lower Rio Grande Valley of Texas, orchards, farms and dense thorn-scrub habitat surrounded his family's roughly 30,000 acres (12,000 hectares) of ranchland. "At that time the Rio Grande Valley was a lovely place," he says. That was then. Now, at 94 years of age, Yturria is angry at how this beautiful valley has been transformed by highways, housing developments and shopping malls: development that has virtually eliminated the unique thorn-scrub habitat that elusive wildlife like ocelots need to thrive in South Texas. Today, parts of the valley look less like a Garden of Eden fed by the waters of the Rio Grande and more like a war zone. Down by the river, where remnants of wild habitat remain, helicopters, patrol trucks and a discontinuous border wall five metres high separate not only the people of Mexico from Texas, but its wildlife as well. Chief among those affected are ocelots. Ocelots are smaller cousins of the more familiar jaguar. Each cat sports its own unique pattern of spots on a body about twice the size of a house cat. Like jaguars, they range throughout parts of Mexico and Central and South America. In the past, they thrived in much of Texas and the neighbouring state of Arkansas. Now, tiny remnants of those populations cling to existence in the southernmost corner of Texas next to Mexico. They emerge only at night to hunt small prey, then retreat from the hot sun and fast cars of daytime into pockets of dense shrub scattered across a chaotic landscape. Biologists estimate that fewer than 80 remain north of the Rio Grande. Without serious help, ocelots will disappear from their historic range in the United States. But Yturria isn't one to sit around and accept the inevitable. Especially when it comes to wildlife. (He claims to have helped restore the endangered Calamian deer and tamaraw buffalo in the Philippines for former Filipino President Ferdinand Marcos.) He has placed all but 4,000 acres (1,600 hectares) of his remaining ranchland in conservation easements held by conservation groups and the United States Fish and Wildlife Service (USFWS) – a total of roughly 26,000 acres (10,500 hectares) so far – specifically to protect endangered ocelots. "Frank Yturria has probably done more than any other single person to protect ocelots in Texas," claims Jim Chapman, Vice-President of the Friends of the Wildlife Corridor, a local conservation group. Chapman and I were standing on a levee a few hundred metres from the Rio Grande in the Santa Ana National Wildlife Refuge, an isolated pearl of thorn-scrub and mesquite habitat hugging the river. Chapman's group supports the US Fish and Wildlife Service in its ongoing effort to acquire land from private owners and create corridors linking such isolated pearls in a continuous strand of useable habitat. They hope that such a corridor would allow otherwise isolated animals to find each other, mate and rebuild a viable ocelot population in Texas. But it's an uphill battle, made harder by another government agency. This past summer, news reports revealed that US Customs and Border Protection had targeted Santa Ana Refuge as a first priority for building President Donald Trump's signature border wall between the US and Mexico. As we stand on the levee running through Santa Ana, Chapman tells me what this means for wildlife habitat. "From where I stand, everything on that side [of the levee] would be removed," he says, pointing across the mesquite scrubland toward the Rio Grande. "An 18-foot-high [five-metre] concrete wall with a steel fence on top of it would replace it. And it would be continuous." I knew exactly what he was talking about because I had seen the future the night before. Scott Nicol, who leads the Borderlands Campaign for the conservation group Sierra Club, escorted me along a section of the wall constructed in the nearby Lower Rio Grande National Wildlife Refuge by previous administrations. There, a five-metre-high concrete wall carved out the previously sloped levee that once allowed wildlife to escape the floodplain during high water. In the summer of 2010, floodwater rose waist-high against the concrete barrier. The USFWS feared wildlife such as the threatened Texas tortoise, and possibly ocelots and jaguarundi, drowned. And the wall pretty much always keeps American visitors out: the birding trail leading to the river from the parking lot is blocked by an imposing gate. 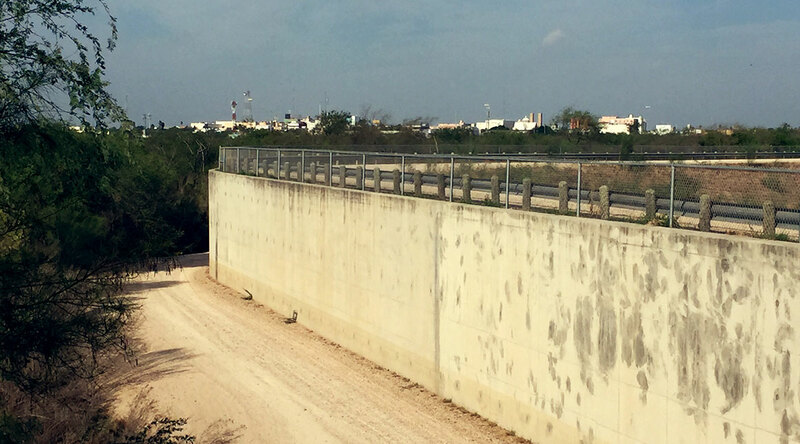 As a deterrent for migrants, meanwhile, "it doesn't even work," Nicol claimed as we walked along the wall's rim. He's climbed a portion of the barrier himself in Arizona. "I see ladders here all the time where people have climbed over. You can see the debris they leave behind in the woods," including life vests from crossing the river. According to Nicol, Border Patrol officials know the wall doesn't work and aren't the ones clamouring for it – politicians are. Although Border Patrol has told conservation and social-justice groups that these areas are hotspots for border crossings, Nicol believes the agency prioritises wildlife refuges because they're easy targets: they're federally owned and readily appropriated by a more powerful agency claiming national security concerns. In response to my inquiries, US Customs and Border Protection responded that exact locations for extending the wall haven't been determined yet. But documents recently uncovered by the Texas Observer suggest that the Santa Ana Refuge has been targeted as a pilot project for the new wall because, as federal land, it's an easy location. It doesn't help that neither the Santa Ana nor the Lower Rio Grande Wildlife Refuges have confirmed an ocelot sighting in their boundaries for years. The last one collared in Santa Ana disappeared in 1996. Instead, the remaining ocelots in Texas live about 80 kilometres north, where ranchland still rules and another wildlife refuge – the Laguna Atascosa National Wildlife Refuge – abuts the Gulf of Mexico. That's where Yturria's land is. The ocelots in Texas exist in two small and separate populations: in and around the Laguna Atascosa National Wildlife Refuge in Cameron County and on private ranchland in nearby Willacy County. Some, including Yturria himself, believe that these lands are the only hope for saving ocelots in the US because the river corridor is just too congested. Biologist Michael Tewes from Texas A&M University agrees. Tewes, who has trapped and collared ocelots in the state for decades, has deemed the Rio Grande corridor useless for their protection because of continuing development and population pressure. But Fish and Wildlife Service biologists dedicated to recovering the ocelot in the US disagree. "The reason there's no evidence the river corridor has worked is because it's not complete yet," said one biologist who asked not to be identified. The recovery team is still trying to convince remaining farmers to dedicate their cotton and vegetable fields to the recovery effort, and allow biologists to expand and restore ocelot habitat along the river. That corridor remains crucial, biologists say, because inbreeding and decreasing genetic diversity in the isolated populations north of the valley threaten their survival. Without an influx of new blood from Mexico, even those ocelots with adequate habitat will disappear. Fish and Wildlife officials have begun discussions with their Mexican counterparts to bring a single female from Mexico into Laguna Atascosa, but the logistics are challenging. Mexican biologists first have to identify a population that could withstand the loss of a fertile female. Then, after navigating permits and other official procedures, US biologists would need to make sure the new female gets introduced into prime habitat safely. Bob Severson, Vice-President of the conservation group Friends of Laguna Atascosa notes "we'd better get it right the first time, because the Mexicans aren't likely to give us another one." A habitat corridor drawing animals north naturally could solve those problems. 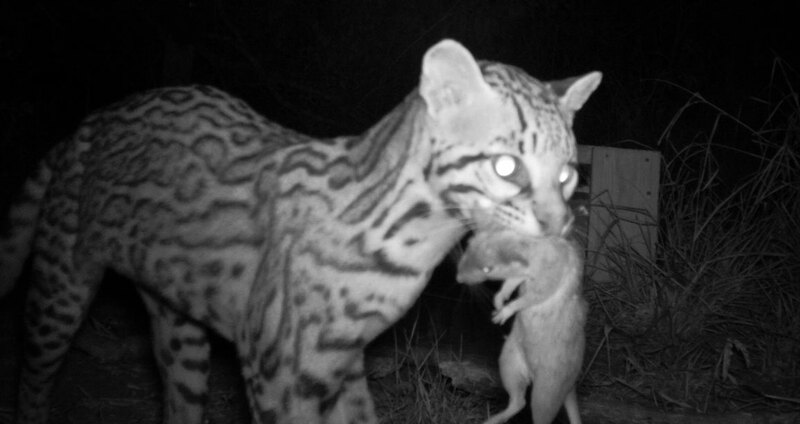 That's one reason why conservation groups such as the Sierra Club, Friends of the Wildlife Corridor and Friends of Laguna Atascosa oppose a border wall preventing ocelot migration. Moreover, the Fish and Wildlife Service's official recovery plan calls for at least two ocelot populations in Texas covering 230,000 acres (93,000 hectares) of land. That's a far cry from the amount currently set aside. Even then, biologists estimate recovery will take about 100 years. But conservationists like Severson take the long view. "In 20 or 40 years if we have reforestation and the population is increasing they could start coming back," he claims, noting that black bears recently returned to Big Bend National Park, farther up the Rio Grande. Elsewhere in the American Southwest, jaguars have begun returning. "If you don't make these efforts now," he says, "you doom this population." 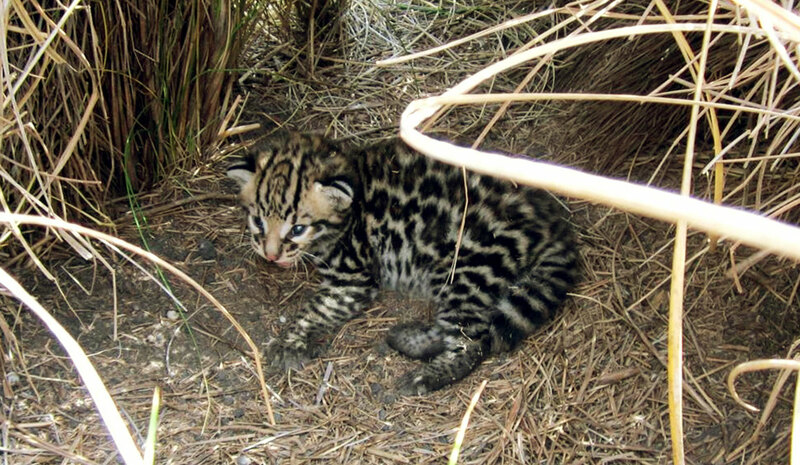 A survey in the Peruvian Amazon has revealed one of the densest concentrations of ocelots in the world. 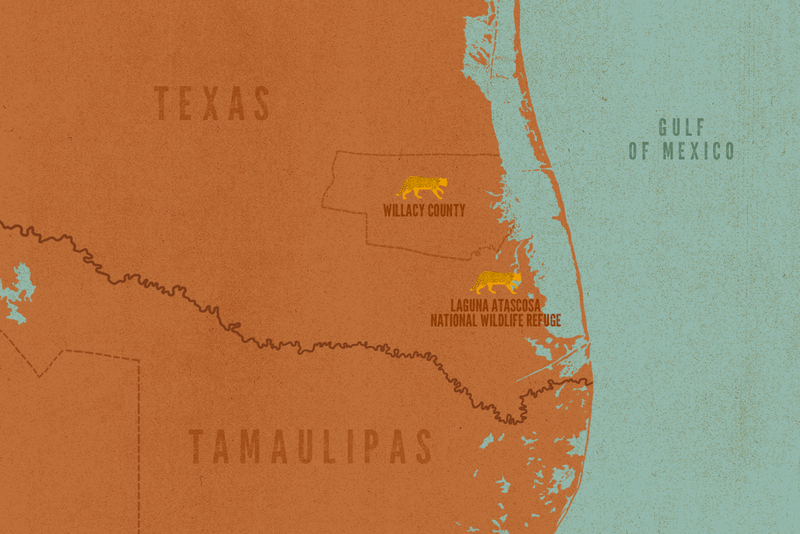 One of the rarest and most striking wild cats in the United States is getting a helping hand in South Texas. The new arrivals are looking healthy and strong.